"We had a great time with Bludgeoned on Broadway this past weekend. This is the third game my friends attempted from your site. Keep up the good work." "A very enjoyable evening [Bludgeoned on Broadway]." "What better way to celebrate being alive and kicking in a new year than an old-fashioned-death-and-deception whodunit? As a New Year's Eve party with the villain nabbed at midnight, Bludgeoned on Broadway gets an Oscar. With plenty of twists and turns and intriguing characters for all ages, this game's a winner. Highly recommended." But still, everybody had a great time. The play was so well written and the characters very colourful. Some of us had some problems last week saying goodbye to their alter ego. We sure want to try another game in the future. Being a host required a lot more than I expected. Instead of getting closer to resolving the murder, people got more confused and I should have taken more care that information was circulating better. The players as well said they would play it very differently a next time. It's definitely a game you must learn to play, but it brings a lot of fun. So thank you very much and best wishes from Nijmegen, the Netherlands!" "Bludgeoned on Broadway was the first murder-mystery we'd ever attended, and my husband and I weren't quite sure what we were getting ourselves into. When the curtain went up we were surrounded by secret alliances, hidden agendas and of course, MURDER! A fun time was had by all trying to discover the who's, what's and why's. What a great way to spend an evening!!" "I had a fantastic time playing Bludgeoned on Broadway. As the host, I had spent a lot of time reading and preparing for the night, I am glad I did! There is a lot of story lines running at the same time and at points I had to give people tips about who to talk to and questions to asked when they got a little stuck. It was good being able to do this easily and from memory. It ran extremely smoothly though and everyone absolutely loved it!" "One thing that some of the kids said (they were 16-year-olds) is how much they enjoyed having a party [Bludgeoned on Broadway] where there was something fun to do, as opposed to standing around not knowing what to do! It really is a perfect activity for teens who want to have fun and be together but have something planned so they don't feel awkward." 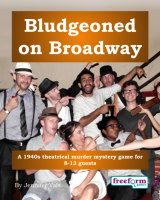 "Bludgeoned on Broadway was a wonderful game, all the guests had loads of fun! " Bludgeoned on Broadway is a dinner party murder mystery game for 8 to 13 guests and a host – download the free introductory pdf file. Join us in a thrilling evening of of drama, double takes, and denouements. You will be in the middle of the action and it will be up to you to wheel and deal with the other guests. Can you achieve your goals, keep your secrets hidden and survive Bludgeoned on Broadway? It's up to you. Bludgeoned on Broadway lasts for about four hours and is suited to an evening. It is often played over a meal – a finger buffet if possible to allow guests to circulate and talk in private. "What a great way to spend a New Year's Eve!I loved it! The mystery was so well written. Everyone seemed to understand and fit into their character role. It is a must play game! " The free introductory pdf file contains an introduction to the game, a cast list of all the characters, and a copy of the New York Press – plus details of how to buy the game. Bludgeoned on Broadway is unlike many murder mystery games. Although the game starts with a murder, most of the characters have more important things to do than to investigate it. And the killing may not be over – it is unlikely that everyone will survive the remainder of the evening! "Bludgeoned on Broadway all went well overall and everyone had fun! Thank you so much for your quick response and a great time!" Bludgeoned on Broadway costs £20.00 (GB pounds) or US $29.99. You can buy it in either currency, from anywhere in the world, as you prefer. The price will be converted back into your own currency for you, at today's exchange rate. We offer a Cast Iron Guarantee on all our murder mystery games. If you're not completely satisfied with Bludgeoned on Broadway then please let us know within 30 days and we will refund you. See our full terms and conditions here.